G’mork: Foolish boy. Don’t you know anything about Fantasia? It’s the world of human fantasy. Every part, every creature of it, is a piece of the dreams and hopes of mankind. Therefore, it has no boundaries. G’mork: Because people have begun to lose their hopes and forget their dreams. So the Nothing grows stronger. G’mork: It’s the emptiness that’s left. It’s like a despair, destroying this world. And I have been trying to help it. G’mork: Because people who have no hopes are easy to control; and whoever has the control… has the power! Sad feels too committed. I would rather wade in the Waters of Unknown Emotion: slightly dangerous, but equally exciting. The Waters of Unknown Emotion- It is like a land you would find in “The NeverEnding Story”, next to the Swamps of Sadness. The Swamps of Sadness– no way, not going there. That is where the horse died: it just got sucked in and was never to be seen again. Perhaps you will find me basking on the Beach of Nostalgia, the swamp is behind me but the sound of ocean waves is nearby. I am just laying out, soaking in the rays of places and people past, feeling their warmth engulf my body as the sunshine penetrates my skin. My golden tan will hold me over as I envision the frigid winter weather that lay ahead (I am going to be digging myself out of emotional snow banks this winter). Come on, I must defend against the Nothing. Oh, and don’t forget my luckdragon…Lupe. “A fictitious flying dragon with a wingless elongated body, possessing neither magical talent nor immense physical strength, but distinctive in its unfailing serendipity” (www.wordnik.com). Yup. Right on. 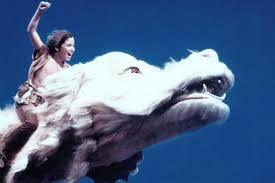 Falcor (the luck dragon): Having a luck dragon with you is the only way to go on a quest. Cold is okay, though. I will adapt, I always do. Shoveling is good exercise. I try not to make situations too loaded. I do not want to invest too much emotion into an “end” because then it is just that: an end. From the get go, I had a strong desire to view this “trip”, “journey” (or insert your favorite related word) as a continuation of my life. I struggled to feel settled with this idea of “getting away” and then “returning” and was resistant to identify with concepts such as wanderlust, or any other romanticized notion that communicates a sense of escape, dreaming, and my personal favorite, “head in the clouds”. As G’mork stated, “Fantasia has no boundaries.” It is alive in all of us (all the time), but sometimes we need to go a quest to experience it’s true strength. And upon return, we are inspired, invigorated, grateful. Besides, I identify more with the image of my head hovering above the water’s surface as my legs kick to keep me afloat- sometimes it is relaxing, sometimes it is exhausting. You have to find your rhythm. Although if you hand me some kid of floating device- I am golden. I could float around forever. The Childlike Empress: Bastian. Why don’t you do what you dream, Bastian? Bastian: But I can’t, I have to keep my feet on the ground! Bastian: All right! I’ll do it! I’ll save you! I will do what I dream! Can’t it all be a continuum? All experiences will be gently protected under the umbrella of life, as opposed to this concept of leaving reality and then having to “go back” (wait for sound of heavy sighs). In reality, when we refer to reality, or the return to “the real world”, are we not just referencing the concept of responsibility? People have strong opinions regarding the topic of responsibility. I think I may be considered irresponsible for even introducing the topic. Bastian’s father: I got a call from your math teacher, yesterday. She says that you were drawing horses in your math book. Bastian: Unicorns. They were unicorns. I feel your pain, Bastian. I still don’t know. Can it be a continuum? Will it be a continuum? Or am I just over analyzing all of this? Most likely the latter. I am going with the Einstein quote these days, “Life is like a bicycle. To keep your balance, you must keep moving.” He was a smart guy. We are on week 6 in Buenos Aires. The reality of returning to a different way of life (that is how i am framing it today- “a different way of life”) has started to reveal itself. Already I find myself zoning out to CSI, and giddy with excitement about watching Girls (a series I had never seen due to our absence of cable.) Wow, we have HBO! Slowly I plug back in, and part of me hates another part of me for finding comfort in David Caruso’s face, and excitement from Lena Dunham’s escapades. I am nostalgic for those slow, hot days in Central America when all I had was a papaya and a book. Conversations of “remember that?”, pervade the daily chatter. As with all losses, there is that transitional space where you have to organize the experience. You need to find a shelf for the books, a box for your letters, a closet for the clothes. The idea of everything being scattered on the floor can be unsettling (as I sit in this rental apartment with my belongings strewn about). It’s a heaping pile of mess and there is nowhere to put all your crap. And in the end you have to accept it (the mess), or be riddled with anxiety. I have a feeling all my crap from the last 15 months will lay out for a while. I have not developed a storage system for an experience such as this. It is new. And with that comes opportunity, perhaps even the possibility of invention! Bastian: What’s that book about? Mr. Koreander: Oh, this is something special. Bastian: Well, what is it? Bastian: But that’s what I like about ’em. Mr. Koreander: Ahh, but afterwards you get to be a little boy again. Bastian: What do you mean? Mr. Koreander: Listen. Have you ever been Captain Nemo, trapped inside your submarine, while the giant squid is attacking you? Mr. Koreander: Weren’t you afraid you couldn’t escape? Bastian: But it’s only a story. The sadness, reality that things will be different, hovers and you just leave it there… hovering… until that moment when it kicks in…”things will be different.” Ah-Ha! Things will be different. I can handle that. But at the same time, a part of you knows that things will be exactly the same. Ugh (heavy sigh). So, How long till we get out, again? “Luck dragon”. Wordnik.com. 2014. http://www.wordnik.com/words/luckdragon (10 December 2014). The Never-ending Story, Dir. Wolfgang Peterson. Perf. Noah Hathaway, Barret Oliver, Tami Stronach. Neue Constantin Film, Bavaria Studios (in collaboration with); Westdeutscher Rundfunk. 1984. “Never-Ending Story Clip- Gmork Scene”. Online Posting. YouTube,10 December 2014. Web. July 25 2007.